Last Friday Brian came home from work with a lovely surprise: about 4 to 5 founds of fresh blueberries! What a treat! We’ve been putting them to good use in smoothies, waffles and even made a blueberry pie, but we still weren’t able to make our way through the whole bag. We’ve already got a stash of frozen blueberries in the freezer, so we needed to come up with another way to store the extras long-term. 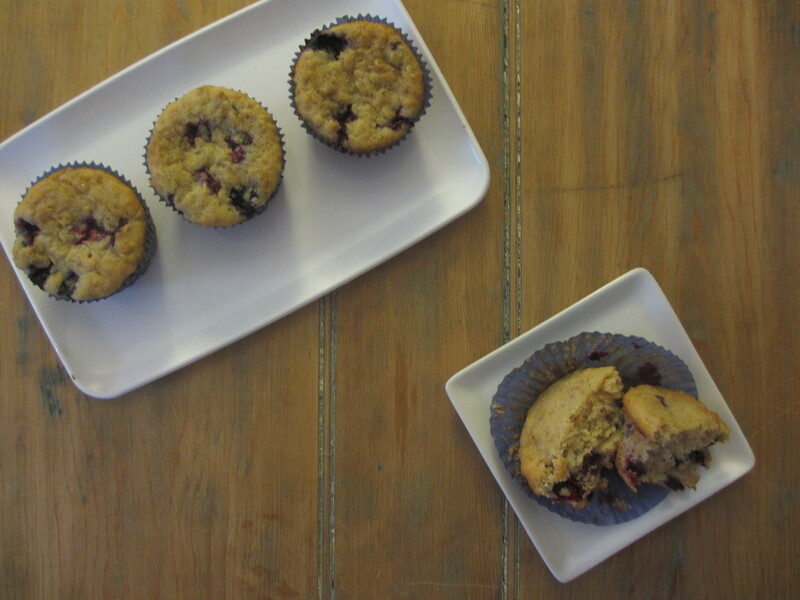 We decided that hearty (and freezable) blueberry muffins would be the way to go. We can enjoy a few now and freeze the rest so we have them on hand whenever we need a quick breakfast treat. We were inspired by an oatmeal muffin recipe from an old issue of the now-defunct Gourmet magazine (moment of silence please). It came from a reader whose mother apparently made these muffins in her home economics class in the 1940’s. The recipe asks you to soak the oats in buttermilk for an hour before you mix everything together, which is essential for the texture of the final product. Of course, we made a few changes as well, the biggest being the addition of blueberries. The result was a chewy, filling muffin with a touch of sweetness. I look forward to having these on hand in the freezer, I just wonder how long they’ll last. 1. In a large bowl, combine the oats and buttermilk. Place the butter in a small bowl and microwave until melted. Place on the counter and let sit, along with the oat mixture, for 1 hour. 2. Preheat oven to 400°F. Line a muffin pan with paper liners and set aside. 3. In a small bowl, sift together the flour, salt, baking powder and baking soda. Set aside. 4. Add the egg, brown sugar and maple syrup to the bowl with the oat mixture. Mix until combined. Add the dry ingredients to the wet ingredients in two batches, incorporating fully after each. Fold in the blueberries. Transfer batter to the prepared muffin pan, filling each liner 3/4 of the way full. Top each with a sprinkle of turbinado sugar. Bake for 15 minutes or until a tester inserted into the center comes out clean. Remove to a cooling rack. SWWU Tip 1: Want to freeze these? Let cool completely then wrap each with plastic wrap. Place wrapped muffins in a zip-top bag and freeze. To thaw, remove from freezer and leave on counter or in fridge overnight or microwave at half power for 20 seconds. SWWU Tip 2: Want more delicious recipes that use oats? Check out these Bourbon-Apple Oatmeal Cookies or these Banana-Oatmeal Chocolate Chip Cookies. I dare you not to love them!